Inline duct fan is essential equipment if you are growing indoors. Right equipment helps to grow healthier and give more harvest seasons per year. Today we will help you to choose your first inline fan, it is not hard to choose but yet it is confusing. Read below to choose the right product according to your plant. It is very important to maintain the right temperature levels all the time for perfect indoor growing. We all know lights produce heat and the reflective surface of your tent increases the heat level inside the tent. Which is not suitable for many plants, this can burn your plant. To treat the excess of heat indoor growers use inline fans for ventilation. Actually this is a ventilation system for plants that are growing in tents where they do not get fresh air. Proper ventilation removes the carbon dioxide out of the grow room and allows fresh air to enter inside. Use Carbon Filter ahead of the duct fan to filter the excess of carbon from the grow space. 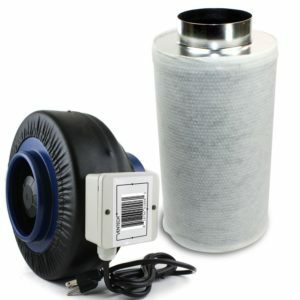 Carbon filters also help to eliminate the bad odors. Fresh air gives strength to the stems and leaves as we human beings need fresh air to live, the same rule applies to plant growth they also need clean and fresh air to breathe. First of all, consider the area where you want to use it or the size of the is you want to ventilate by the duct fan. CFM: It stands for “cubic feet per minute” this means the amount of air a fan can through in a minute. This formula helps you to calculate the right amount of CFM you need and then you can choose the right product according to CFM. Length x Width x Height OF GROW Area (unit in feet). than multiplied it by 125% (or with 1.25). If you have a limited budget to spend on inline duct fan do the following to get minimum CFM ratings. Do the above calculation and divide it by number 3. It also depends upon which type of light technology you are using because some lights produce more heat energy than others. Identify the amount of heat emitted by your light then choose the higher GFM rating inline fan. Choose the diameter according to your growing area but in case you are unable to calculate we advise you to choose 6 inches,4 inches, 8 inches. These are the common type of setups normally found everywhere. Scroll the list below and read a review on each branded and top-selling perfect duct fan. 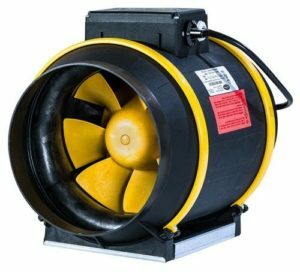 Can Fan Pro series is a line of effective and durable duct fans. They made all high-quality inline fan. Fiberglass material gives extra strength to plastic components. The company claimed that they consume less energy and run smoother than Max fans. All the components meet UL and CSA requirements. Here are the ratings. 6 inches fan 420CFM whereas 8 inches 863 CFM. Both come with 3-speed control options. Which make it easy to adjust the speed according to the growth cycle. 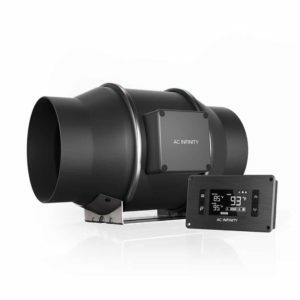 VIVOSUN 8 inches 720 CFM inline duct fan. Energy efficient fan for ventilation runs at speed of 2450 rpm. This is quite high speed and little noise at this RPM is normal. But still, company make great efforts to lower down the noise level. VIVOSUN never compromise with the quality of the product so if you are choosing vivosun fan you are choosing better quality. It only needs 1.6 amperes of electric current at the voltage of 110/120 volts. If we talk in watts it is of total 190 watts (powerful motor at this size). durable plastic fan holding sockets which can easily handle this weight. Variable speed controls to adjust it when needed. Removable duct ends for easy cleaning. APOLLO Horticulture is the manufacturer of indoor grow equipment. They make latest products at low prices as much as possible. This is their another ventilation fan use to remove smell, carbon and other odors from the space. The fan is designed to give maximum durability. Energy saving technology with low noise fan motor. A built-in speed controller to adjust the speed according to present conditions. Good quality of plastic is used so that you and your pant can breathe easily without any harmful effect. Voltage: 115AC, power in watts 35W, current consumption: 0.13amps, 2500 RPM. 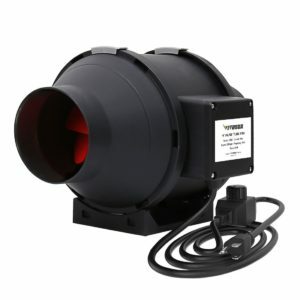 VenTech Fan is a superior quality fan for indoor growers. This is a strong fan with steel structure which gives it full strength and this is the reason it is more in weight as compared to its competitors. This professional product is also used in other places like nursing homes, hotels etc. The power rating of this fan is low as compared to the market but they give carbon filter with this which make it a great deal. This filter removes the excess of carbon from your grow area. If you go for other fans you have to buy filter separately but with this deal, it comes together with a fan. The product is backed by the one year warranty. 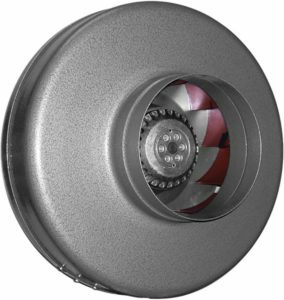 Vertex power fans are constructed with high quality steel and to increase the durability they are coated with a hammertone finish. Rustproof fans for long-run operations. The motor produces 449 CFM which is good and ideal for plants. Vibration free motor does not make any noise or the noise levels are almost negligible. It produces much sound than an air conditioner. Easy to install horizontally or vertically both options are available as both brackets are given on sides for extra convenience. The heavy-duty motor is impact resistance, do not have to lubricate. The product comes with the long warranty of 10 years. Hurricane INLINE DUCT FAN 12 inches. 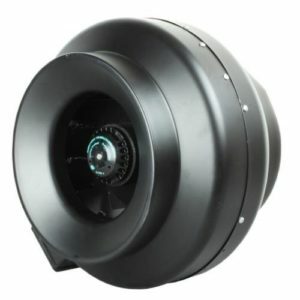 Hurricane manufacture inline duct fans with UL rated components and give powder coated finish for maximum performance. The finish prevents rust and makes it rust proof inline fan. Many sizes are available in this brand like 4 inches 171 CFM, 6 inches 435 CFM, 8 inches 745 CFM, 10 inches 780 CFM, and 12 inches 1060 CFM. Easy to install the package contains everything you need to install. Great product to buy for small growing areas. 10 inches in size with the air flow of 760 CFM. It has ceramic coatings which prevent rust and dust particles away from the motor. The internal functional motor is thermally protected which means with the long run operations the motor does not get hot. Like other fans, it also produces low noise which does not disturb you if you are studying or sleeping near the fan. Highly efficient internal components which increase the overall performance of Fan. 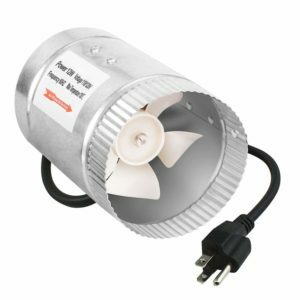 These are the cheap and best Inline fans for any type of grow tent. They are made of high quality material. Better quality at affordable price. If you check the ranting on Amazon they got 4.5 star out of 5 stars this shows the customer satisfaction. More than 100 happy customers make this brand top selling brand over the internet. These are the best inline fans which you can use to prevent the excess of heat from your grow tent they also supply the fresh air to the growing plants. Plants need plenty of fresh air to grow and by installing one of these fans you can give your plant the constant supply of fresh air to breathe. Do not need to buy a single thing from the market separately if you buy these fans. They come with everything from clamps to screws to manual guide. Just read the instructions carefully and install them your own. The installing process is very easy and perfectly mentioned on the user manual guide. As you can see in the image above fan comes with a controller which has lots of interesting and useful features. When the temperature goes above the normal level the sensors detect it and turn ON the fan automatically. You do not need to adjust the speed it has speed controlling system in it which adjust the fan speed according to the inside temperature of grow tent. It has inbuilt integrated memory chip which saves the instruction feed by the users and machine run according to them. For example, if you want your inline fan to run for 6 hours continuously at different speeds you can set the command in the memory. The total life of fan motor is 67,000 hrs mentioned by the manufacturer. In Box, you will get FREE AC cable, Clamps and Mounting Hardware. Nothing is mentioned about the product Warranty. Sometimes you need to circulate the air that is inside the grow tent for this job you need a fan with strong air flow. 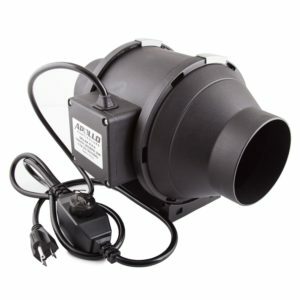 Ipower 4-inch booster fan is a great choice to circulate the air inside or to exhaust the air from the grow tent. If your existing HVAC system is weak and you need additional air booster the buy this right now it is available at the reasonable on Amazon. Attach it today with your installed system and increase the efficiency of your overall exhaust system. If your budget does not allow you to upgrade your whole system then adding this will be a smart idea. It saves lots of your money and put new life into your HVAC system. Attach this booster fan to the ducting and it is done (so simple no rocket science is required). If you talk about the quality, it has aluminum made blades that run at high speed but does not produce sound (quiet operation). Even at the very high speed, you will hear any kind of noise from the system. Maintenance free product, no need to lubricate the motor as it has a self-lubrication system in it. So, no any extra cost after purchasing the product. The product is backed by the 1-year manufacturer’s warranty. iPower is a well-reputed company in indoor growing market. They supply almost all types of equipment that you need to grow plants indoors. They are the big supplier of an artificial lighting system that is used by the growers to grow vegetables and fruits without sunlight. You can every type of tool and equipment that you are going to use in home gardening. They have 3 different sizes of fans that can be easily used in grow tents. 4 inches, 6 and 8 inches diameter fan are available by the company. All of them are highly rated fans on online shopping site like Amazon. Yes, They all look similar to each other but in actual they have different specifications that are listed below. The main use of a duct fan is it throughout the hot air from the growing area and bring fresh air inside. Good ventilation is everything when we grow plants inside our house. In the open field, plants always stay in touch with the fresh breeze but at our, there is not pollution or dust but less amount of fresh air. 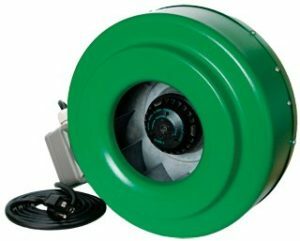 To give them fresh and clean air indoor growers use best inline fans that deliver clean air to the plants. No need to replace the entire system just install the fan according to the size of your ventilation duct and your job is done here. These are the best inline fans for grow tent. All fans come with long power cords nearly about 5 meters. Highly durable as their outside body is coated with several layers of ceramic which increases their lifespan. Maintenance free product, no need to lubricate the motor or any other part of the fan. We did not find any negative side of these fans at this price range.